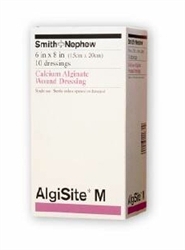 ALGISITE M is a calcium-alginate dressing which forms a soft, gel that absorbs when it comes into contact with wound exudate. ALGISITE M helps utilize the proven benefits of moist wound management. ALGISITE M is easy to remove. It conforms to wound contours and has fast gelling, high mannuronic acid fibers. It features low fiber shed and has high wet and dry strength. They are soft and conformable. It is easy to remove. When used in a moderate to highly exuding wound, the dressing forms a soft gel, which does not adhere to the delicate healing tissues in the wound bed. The dressing can be easily lifted out of the wound in one piece, or washed out with saline. Dressing conforms to wound contours. ALGISITE M is very soft and conformable, allowing it to be molded, folded or cut to meet a wide range of wound shapes and sizes. As the fibers gel, an even more intimate contact with the wound is produced and maintained. ALGISITE M has less fiber shed. All fiber based alginates release fibers when handled, however the advanced bonding technique employed in ALGISITE M greatly reduces this. It provides a moist wound environment. The production of a gel by the action of exudate on the alginate fibers creates a moist wound environment at the wound surface. This helps prevent eschar formation and promotes an optimal moist wound environment. The dressing allows wound contraction to occur, which may help reduce scarring and also allows gaseous exchange necessary for a healthy wound bed. ALGISITE M is highly absorbent. In-vitro studies have shown that ALGISITE M can absorb 13 times its own weight in exudate. This allows the dressing to remain in the wound for up to 7 days, depending on the nature of the wound and the volume of exudate. Choose a dressing that is slightly larger than the wound and place it in intimate contact with the wound base ensuring the entire surface is covered. It may be best to use the alginate strip if the wound is deep or undermined. To help avoid maceration of the surrounding skin, cut the ALGISITE M to the size of the wound or alternately fold any dressing material overlying the wound into the wound. Apply using an appropriate dressing technique. Cover with an appropriate retention dressing. Wound exudate will evaporate from the gel surface; the secondary dressing should not hinder this evaporative process where exudate is heavy. Generally dressings should be changed daily in heavily draining wounds, reducing to twice weekly (or weekly) as healing proceeds. To remove ALGISITE M, use tweezers, forceps or a gloved hand to gently lift the dressing away - the high wet strength generally allows it to remain in one piece. The dressing may adhere if used on a very lightly exuding wound. Removal of the dressing is facilitated by saturating the wound with saline. Ensure the packing in cavities, sinuses etc. has been removed. The dressing may adhere if used on very lightly exuding wounds. If the dressing is not easily removed, moisten it with saline, then remove. Do not use on patients with a known allergy to alginates.